A plaque commemorates the service of local government politician , Lewis Klug to the community of Queenscliff. Mr Klug, who died in 1939, was mayor of Queenscliff 14 times. QUEENSCLIFF. Thursday. 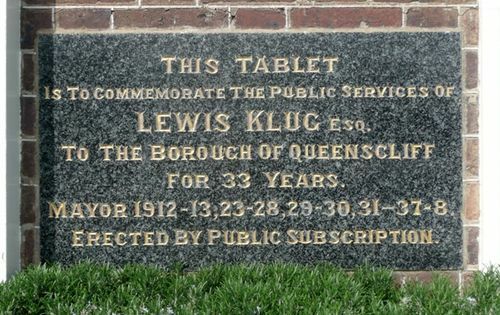 To mark the services to the borough of Mr. L. Klug for 33 years and his retirement from public life owing to ill health, a granite tablet was placed on the wall of the Free Library. The tablet was unveiled today by the Mayor (Councillor P. C. Shoppee) before a large attendance of borough councillors, residents, and school children. The Mayor paid a tribute to the work of Mr. Klug, who responded. Argus (Melbourne), 16 December 1938. The death occurred in Melbourne early yesterday morning of Mr Lewis Klug JP of Queenscliff who recently retired from municipal life after 33 years service. He was aged 72 years. Only five weeks ago he received a civic tribute from residents of Queenscliff and a tablet in recognition of his services was unveiled at the free library. Mr Klug was Mayor of Queenscliff 14 times and on two occasions for six years in succession. Other positions which he held were president of the golf club, the bowling club, the cricket club, the football club and the district cricket and football associations, and secretary of the free library and the horticultural society. He was a delegate on many occasions to municipal and Australian Natives Association conferences and was a member of the ANA for more than 50 years. Argus (Melbourne), 21 January 1939. Mayor 1912 -13, 23 - 28, 29 - 30, 31 - 37 - 8.